MDN Inc. (“MDN”) (TSX:MDN) is pleased to report early results for its exploration program at its wholly-owned Nikonga project in Tanzania. MDN geologists carried out initial sampling during a mapping program. The results are very encouraging, with the eastern sector returning grades ranging from 4 g/t gold to a maximum value of 33 g/t gold. In all, 29 rock grab samples were collected in the vicinity of two artisanal mining sites. The first site sampled was the main structure, Kezeria, which strikes at 290° and where the highest value of 33 g/t gold was obtained. The second site is a subparallel structure striking at 306°, about 500 m to the north of Kezeria. This site returned a maximum grade of 23.7 g/t gold. The gold grades from the artisanal mine sites coincide with two sub parallel trends of soil geochemistry anomalies with gold values from 50 to 580 ppb. These two trends are 500 metres apart and strike northwest in the same direction as the regional northwest lineament that connects the Nikonga property to the Tulawaka mine, 40 km to the northwest. The lineament can be seen on topographic maps and regional satellite images. Mapping revealed that the outcropping rocks generally lie above an elevation of 1,230 m where they have been exposed by soil erosion. The bedrock can also be seen in the pits dug by the artisanal miners. The lithologies are clay, sandstone, gravelly sandstone and arkosic sediments to the north, in contact with volcanics or granite to the south. These sedimentary and volcanic rock units have been injected by the gold-bearing quartz veins. The veins are generally grey to black quartz. Gold mineralization has been confirmed in the Kezeria sector and 500 metres to the north in sub parallel structures. 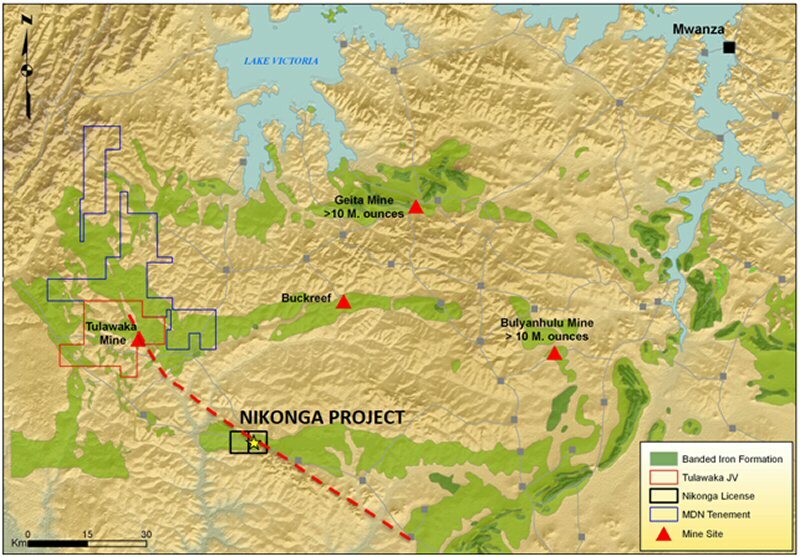 “The high grades of over 20 g/t gold and the geological environment allow us to draw a parallel with the situation at the time of the Ikungu project acquisition by MDN in 2008. Nikonga is a property where artisanal mining has taken place and where lateral extensions characterized by gold soil anomalies similar to those at Ikungu are found. Moreover, we are located on a NW structural lineament connected to the Tulawaka Mine” said Marc Boisvert, MDN’s Vice President of Exploration. The samples were analysed by fire assay at the SGS Laboratory of Mwanza, Tanzania, which is certified according to international standards. A stringent assay quality verification program implemented by MDN included 20% control samples. The technical and scientific information contained in this press release has been reviewed by Marc Boisvert, engineering geologist and Vice President, Exploration, who acts as a qualified person in accordance with National Instrument 43-101.